It's getting so an author can't go out and play in the street without drawing a crowd! Well, not quite, but while getting the cover art for Deadly Gamble, it sure felt that way. 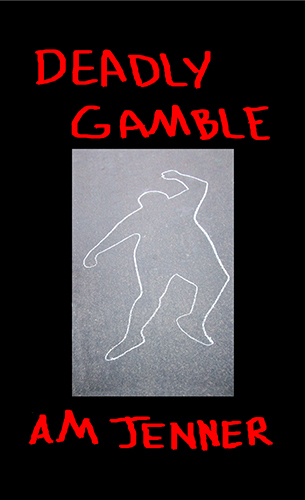 After the concept for the cover art had changed several times, we finally hit on the idea we wanted; a chalk outline on pavement, absolute proof in the entertainment world that a corpse was involved. The idea came late in the afternoon on Christmas Eve, the pavement in the street outside was cool enough to lie on, and I took my adult daughter out into the street to be my model. She laid down, and I began tracing around her with a stick of white sidewalk chalk. When we were nearly finished, a car drove past. I ignored it. A minute later, it came back, pointed the other direction. A woman got out, wanting to know how she could help. It seems her young daughter had seen my daughter lying in the street and was worried about her. We explained we were making a book cover, and everything was fine. They asked again to make sure all was well, then went on their way, satisfied they'd done their good deed for the day. We finished the photo shoot while giggling. We'd have a fun story to tell later. I put the pictures into the computer, and didn't bother with them, since it would be months before I was ready to make the cover. June came, and I was deep in the production of Deadly Gamble. It was time to make the cover, but the artistic shadows from the bare branches of our tree made the pictures unusable. What I needed was photos without shadows, but it being June, I couldn't have my daughter lying on the hot asphalt at noon. We decided to re-shoot just after dawn, when there would be even lighting and cool asphalt. On a Saturday morning, we put my daughter down in the street again and began drawing. Anne was down on her knees, tracing our willing corpse, and I was standing in the middle of the street making sure they didn't get run over. Two women came by, with that garage sale look in their eyes. They stopped and asked if my daughter was all right. We assured them she was, that it was a photo shoot for a book cover. They drove away, but didn't really believe us; about three minutes later, a police car came slowly cruising down the street. Fortunately my daughter was now vertical. The police car slowed, nearly stopped, and Anne waved him on his way. A minute later, the women came past again, obviously disappointed that we weren't being arrested. These pictures worked out well. During the second shoot, I had taken a shot over Anne's shoulder as she wrote our name on the street. I intended to use it for the author photo on the back, and it was good, but our name wasn't complete enough to see what she was writing, so she asked to reshoot just the one picture. Saturday arrived, and we draped our cooperative part-time corpse on the street again, and Anne started the outline. Just as I was about to snap the photo, a neighbor drove by and wanted to know if there was anything he could do to help us. It's hard to explain that it's a book cover photo shoot when you have a giggling corpse behind you. Here's the finished cover, what do you think?